Fan clubs are interesting entities. They issue from one primal drive: devotion. A shared devotion to certain people or things brings fans together to express a corporate love and loyalty to their idols. It’s one thing to be devoted to someone or something. But it’s way cooler to share that devotion with others. Take a Beatles fan club, for example. 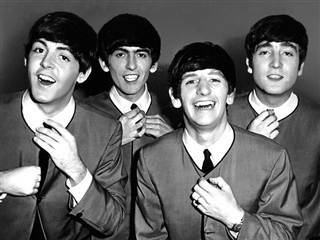 Beatles devotees get together on a regular basis to share stories about how they almost met Paul’s gardener or almost got Ringo’s autograph. They pull out and pass around “relics”, like George’s guitar pick or John’s toothbrush. They engage in passionate debates about which Beatles’ album was the deepest or which of the Fab Four had the coolest overbite. In fact, a Beatle’s fan club meeting has pretty well everything a fan needs, except for one thing. It is in this sense, that the Church is not a Jesus fan club. Of course, devotion to Jesus draws His people together to express their love and loyalty to Him, and in many ways, we are Jesus’ fans, but when we gather, the fan club analogy ends. This is because, according to the Bible, God’s people not only meet in the name of Jesus, but in His presence! In Matthew 18:20, Jesus Himself says, “For where two or three are gathered in my name, there am I among them.” Now, if Jesus just stayed dead after He died on the cross, He wouldn’t be able to pull this off, and we would console ourselves with a sentimental, figurative interpretation of this passage. But He didn’t stay dead. According to scripture, He rose from the dead on the third day and, after reuniting with his amazed disciples, taught them for a few weeks before ascending back to heaven, and resuming His omnipresent nature. So with this in mind, when He says that He is there among us as we meet, He means just that. He is present. And it doesn’t stop there. The Church would certainly do well to not meet as if Jesus was absent from our midst, but we would also do well not to meet as if the Lord was merely passively present. When Jesus says that He will be with His Church, He doesn’t mean that he will be standing in a corner like some Tiki idol, mutely observing the proceedings and receiving the occasional nod in His direction. In Ephesians 1:22, Paul says, “And he [the Father] put all things under his [Jesus’] feet and gave him as head over all things to the church”. So Jesus isn’t absent from our Church gatherings, and He doesn’t settle for a passive presence in our midst. His presence among us is a presiding one. He’s in charge! If we begin to wrap our minds around this fact, our Church services might end up being radically different than we may be used to. Imagine if the Beatles actually turned up at a Beatles fan club meeting (a scary thought today). No one would care about John’s toothbrush when John is standing there. No one would insist on reading the fan club’s minutes or follow the official agenda when the Fab Four walk in and say, “Hullo, mates”. No one would have a lot to say about Ringo, but they might have a lot to say to him. And the monologues would become dialogues. The Church doesn’t need to imagine what would happen if Jesus showed up at a Sunday service. It happens all the time. I hope He has a sense of humour about being treated as if He is absent or passively present in His Church. But we would do well to embrace the reality of His presiding presence among us, and adjust our meetings accordingly. And as Jesus’ fans, we might even find ourselves running to Church.